Charming villa with private pool in the picturesque town of Tossa de Mar on the Costa Brava. The perfect location for couples and families! 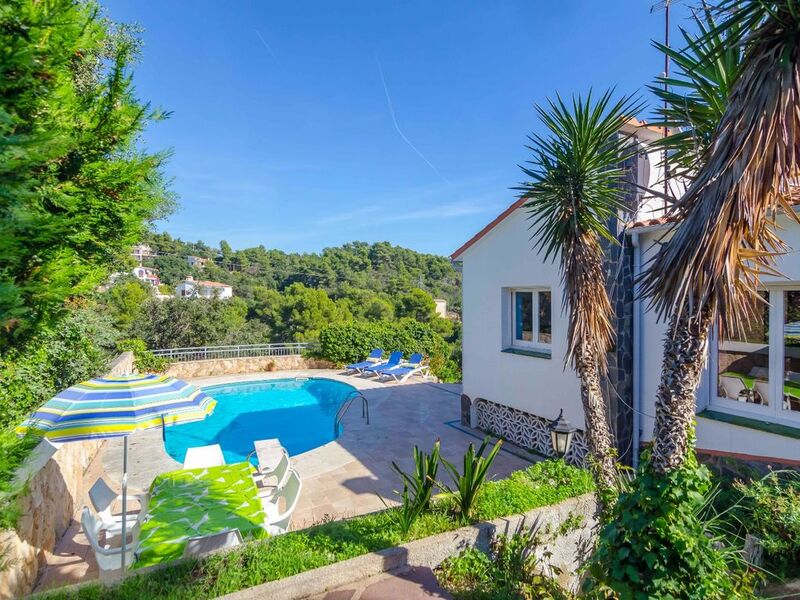 This charming authentic Spanish 2-bedroom villa has a private pool and is beautifully situated just 800 meters from the beach of Tossa de Mar. Villa Dagmar is located in a residential area on a quiet street with only local traffic. Your car can be parked in the parking bay. Because of its privacy and ideal location in a beautiful green wooded area, Villa Dagmar is particularly popular with couples and families. Villa Dagmar is a ground floor level villa which has a beautiful fully furnished living room with satellite TV, CD player and DVD player and a fully equipped kitchen that has all modern conveniences. Furthermore, there are 2 spacious bedrooms and 1 bathroom with shower. The practical interior of the villa features warm colours and a cosy typical Spanish atmosphere. In addition, the villa offers free Wi-Fi! On the side of the villa is a beautiful private pool, which can be reached by a short flight of stairs. Around the pool you will find a landscaped terrace with sun beds where you can relax and enjoy the Spanish sun while enjoying a good book or a glass of wine. The villa has a beautiful natural garden and a lovely spacious terrace to enjoy your dinner al fresco, prepared on the stone barbecue. Villa Dagmar will let you experience the ultimate in relaxation in wonderful Spanish outdoor life! Tossa de Mar, situated along the Costa Brava, has many relics from the era in which the city originated. Because life on the coast became increasingly dangerous because of incursions by the enemy, inhabitants erected ever higher walls around the city. The famous castle of Vila Vella with its small passageways and stairs, has remained almost completely intact! This place exudes so much romance and features a number of excellent fish restaurants where you can enjoy a wonderful evening for two. Tossa de Mar also has a beautiful wide sandy beach where many activities are organised and where you can participate in various water sports. Of course you can also just enjoy a stroll along the promenade and relax on one of the many terraces. If you prefer to escape the hubbub of the Spanish coast for a while, take a trip to the green surroundings of Tossa de Mar, where you will find yourself in an oasis of calm and where you can witness traditional crafts such as pottery and basket weaving. The centre of Lloret de Mar (located only 11 km away) is particularly suitable for shopping or enjoying the famous nightlife! Kleine gemütliche Villa mit Meer Blick - Wir waren 2. Wochen in Tossa de Mar, der Service und freundlichkeit der Mitarbeiter -Top, Villa super Sauber, Der Pool regelmässig gereinigt - haben bereits wieder gebucht. Von anfang an wurden wir durch unseren Residenten betreut - auch bei Autopanne war er sehr hilfreich, er kam auch regelmässig und reinigte den Pool. Ruhige Umgebung, der nächste Große Geschäft war 5km von uns entfernt. Strand Sauber und ruhig - nur der Weg dorthin ist Steil. Club Villamar und Die Villa "Dagmar" kann ich nur weiter empfehlen - wer schöne Natur, super Strand und abnedliche Ruhe sucht ist hier perfekt aufgehoben. Die Buchung verlief beide Male schnell und unkomplizierzt, empfehle Euch direkt über die Internetseite zu Buchen. Nous avons passé un agréable séjour à Tossa de mar. La maison est accueillante et la région particulièrement belle. Un seul bémol à souligner : les photos du jardin de la maison ne sont pas conformes à celles du site. Lors de notre arrivée, nous avons constaté qu'il n'y a plus aucun palmier ni aucune végétation dans les jardinières. Ceci était d'autant plus dérangeant que l'espace repas extérieur a une vue directe sur les poubelles de l'urbanisation et sur un espace ressemblant à une décharge sauvage. Une simple palissade en bois positionnée derrière le barbecue aurait pourtant permis de solutionner ce problème. Dans l'ensemble, notre impression reste tout de même positive. Le personnel de l'agence Club Villamar est particulièrement réactif et a répondu à chacune de nos demandes.De même, la maison, parfaitement propre lors de notre arrivée, était fonctionnelle. Schönes Haus! Sehr sauber, schöne große Terasse mit Pool! Sehr empfehlenswert! Ein geräumiges gut ausgestattetes Haus für 4 Personen. Freundlicher Service, sehr sauber. Die große Terasse mit Pool lädt zum Entspannen ein. Sehr empfehlenswertes Ferienhaus!